Interest in methanogens from ruminants has resulted from the role of methane in global warming and from the fact that cattle typically lose 6 % of ingested energy as methane. Several species of methanogens have been isolated from ruminants. However they are difficult to culture, few have been consistently found in high numbers, and it is likely that major species of rumen methanogens are yet to be identified. Total DNA from clarified bovine rumen fluid was amplified using primers specific for Archaeal 16S rRNA gene sequences (rDNA). Phylogenetic analysis of 41 rDNA sequences identified three clusters of methanogens. The largest cluster contained two distinct subclusters with rDNA sequences similar to Methanobrevibacter ruminantium 16S rDNA. A second cluster contained sequences related to 16S rDNA from Methanosphaera stadtmanae, an organism not previously described in the rumen. The third cluster contained rDNA sequences that may form a novel group of rumen methanogens. The current set of 16S rRNA hybridization probes targeting methanogenic Archaea does not cover the phylogenetic diversity present in the rumen and possibly other gastro-intestinal tract environments. New probes and quantitative PCR assays are needed to determine the distribution of the newly identified methanogen clusters in rumen microbial communities. Methanogens are members of the domain Archaea, and fall within the kingdom Euryarchaeota . They are obligate anaerobes and can be unambiguously differentiated from other organisms since they all produce methane as a major catabolic product . Interest in methanogens from ruminants has resulted from the role of methane in global warming and from the fact that cattle typically lose 6 % of ingested energy as methane . Several species of methanogens have been isolated from ruminants, but few have been consistently found in high numbers  and it is likely that major species of rumen methanogens are yet to be identified [5, 6]. The most common species of methanogens isolated from the rumen are strains of Methanobrevibacter, Methanomicrobium, Methanobacterium, and Methanosarcina [6, 7]. The taxonomic status of isolated rumen methanogens has not been adequately resolved and will require analysis at the molecular level for clarification . Methanogens are frequently found in association with protozoa [9,10,11,12,13]. A recent study using 16S rRNA probes directed against different families of methanogens indicated that some methanogens have a preferred association with protists while others are primarily free living . We have undertaken this study to examine the free living community of methanogens within bovine rumen fluid using comparative sequence analysis of cloned 16S rRNA genes (rDNA) amplified from total DNA extracted from clarified rumen fluid. Forty-one 16S rDNA sequences were analyzed. The clones were designated ARC, followed by a clone number. The sequences ranged in size from 1009 - 1055 base pairs (bp). On the basis of sequence similarity, all of the sequences were related to methanogens. The sample preparation technique, centrifugation before DNA extraction, allowed us to preferentially examine methanogens isolated from the fluid fraction of rumen contents. Three distinct clusters were generated by nearest-neighbor analysis of the cloned sequences (Fig. 1). Unrooted phylogenetic tree constructed using a neighbor-joining method. The clones from this study are labeled ARC## and are shown in relation to related species and clones. Brackets indicate clusters UNI (unknown methanogens), Mbr (Methanobrevibacter ruminantium related clones), and Mss (Methanosphaera stadtmanae related clones). Bootstrap values greater than 70% for 1000 trees are shown at major branch points. Halobacterium halobium was used as the out-group. The bar represents a sequence divergence of 10 %. The largest number of clones (24) grouped with Methanobrevibacter ruminantium, forming two distinct subclusters that were supported by high bootstrap values (Fig. 1). Subcluster Mbr I consisted of nine identical or nearly identical sequences (similarity values ranged from 99.4 to 100 %) that were 98.5 to 98.8 % similar to M. ruminantium. The second subcluster, Mbr II, formed a deeper branch consisting of fifteen cloned 16S sequences that were from 99.3 to 100 % similar to each other. Members of this group had sequence similarity ranging from 97.2 to 97.7 % with M. ruminantium. Boone et al. considered that a sequence similarity of 98 % or less was evidence for separate species within the methanogens. Based on this, members of Mbr I would be considered M. ruminantium strains, while members of cluster Mbr II are a separate species of Methanobrevibacter. However, as pointed out by Martinez-Murcia et al. , 16S sequence similarity values recommended to define a species provide a working definition that has been empirically derived, and values should not be treated as absolute or fixed. For example, 16S rRNA sequences from strains of Methanobacterium thermoformicicum and M. thermoautotrophicum used in this study were greater than 98 % similar, yet these organisms are considered distinct species. Methanobrevibacter spp. are thought to be the most significant species of rumen methanogens based on both culture methods [4, 6], and by analysis using rRNA-targeted oligonucleotide probes [14, 17]. 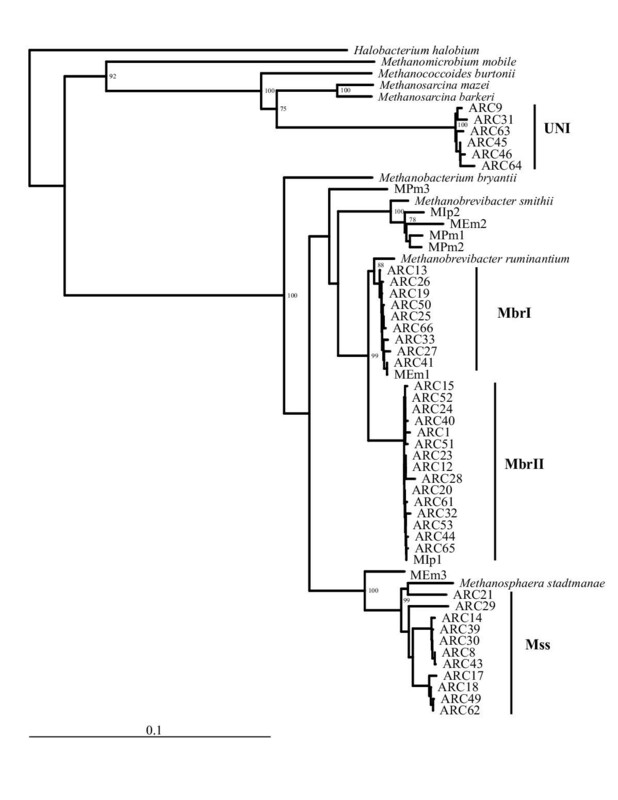 The type strain, Methanobrevibacter ruminantium M1 , is characterized by a requirement for coenzyme M . Two studies [8, 20] indicated the presence of a physiologically diverse population of methanogens with characteristics of Methanobrevibacter spp. but distinct from M. ruminantium M1. In both cases some isolates had a requirement for coenzyme M while others did not. Miller et al. found that none of the strains reacted with an antiserum to the type strain. Similarly, a coenzyme M requiring strain isolated by Lovley et al. did not react with a similar antiserum. These authors were not able to determine the taxonomic status of the bovine Methanobrevibacter spp. isolates based on the physiologic, morphologic, and immunologic tests used. Two sequences cloned from protozoal associated methanogens, MEm1 (GenBank AB026170) and MIp1 (GenBank AB026168), were associated with subclusters Mbr I and Mbr II, indicating that these clusters are not strictly associated with planktonic methanogens. The second largest cluster contained eleven clones grouped with Methanosphaera stadtmanae. M. stadtmanae belongs to the family Methanobacteriaceae. The type strain M. stadtmanae MCB-3 is a resident of the human large intestine . However, this is the first report of organisms similar to M. stadtmanae being identified in a ruminant. Within this cluster, the cloned sequences formed four subclusters. It should be noted that the significance of the subclusters is not supported by high bootstrap values (Fig. 1). Clones within this cluster had sequence similarity values ranging from 96.1 to 97.3 % with M. stadtmanae. The rDNA sequences may represent three distinct species of Methanosphaera. Cluster UN I (Fig. 1) contained six highly similar clones with sequence identity ranging from 99.0 to 99.8 %. This cluster is branched within the Methanosarcinaceae but the rDNA sequences do not share a high degree of sequence similarity with any known 16S rRNA sequences. Methanosarcina sp. str. WH1 and M. thermophila sequences were the most similar to members of UN I, with sequence identities of approximately 89 %. Significantly, sequences in cluster UN I do not contain sites matching probes designed for 16S rRNA for currently characterized Methanosarcinaceae . Lin et al. speculated that the presence of an archaeal group not covered by archaeal group specific probes may be responsible for the lack of additivity of these probes when compared to signals from the general archaeal probe. From 20 to 60 % of the general archaeal probe signal they detected in rumen samples was not accounted for when probe signals specific for Methanococcaceae, Methanobacteriaceae, Methanosarcinales, and Methanomicrobiales were summed. The latter three probes currently cover all rumen methanogens that have been successfully cultured. Similarly, a lack of additivity in the current set of methanogen targeted probes has been noted when termite gut contents were analyzed . The unknown group of archaeal sequences identified in the present study arise from novel methanogens not previously described and could probably account for some of the signal not identified in previous studies. We are currently designing new sets of 16S rRNA probes and primers that may quantify this unknown group in rumen and intestinal communities. The discovery of uncultured groups of methanogens and their divergence from known species may make a vaccination approach  to the control of rumen methanogenesis difficult. Recently a study was published that analysed a limited set of archaeal clones obtained from a sheep rumen . The sequences of these clones were determined at the 3' end of the 16S rRNA gene and generated very little, if any, overlap with the clones in this study. The short sequence length of these clones prevented their inclusion in a reliable reconstruction of the phylogenetic tree. Their relationships to the clones presented in this study are therefore unknown. It is interesting to note that the majority of clones in the study of Yanagita et al. demonstrated similarity to M. smithii, with fewer clones being related to M. ruminantium. Sequences of methanogens associated with rumen protozoa have been shown to be highly related to M. smithii  as well as M. ruminantium . Previous culture based studies have isolated methanogens of the genus Methanomicrobium and Methanobacterium from the bovine rumen [7, 25, 26], although Methanobrevibacter and Methanosarcina tend to be isolated at higher population levels . The present study did not find any sequences closely related to Methanomicrobium, Methanobacterium, or Methanosarcina. This may be due to differences in sample preparation, animal diet or geographic region. Clearly more studies are needed on the effects of diet and animal species on the diversity of methanogens in the rumen. Of particular benefit would be studies relating the phylogenetic diversity of methanogens in the rumen, using techniques such as Denaturing Gradient Gel Electrophoresis (DGGE), to the amount of methane produced by the animal. This study has revealed the phylogenetic diversity of methanogens found in the rumen fluid of dairy cattle. One of the methanogen groups is highly similar to the type strain of M. ruminantium, but other groups represent methanogens not previously recovered from the rumen or not yet represented in culture collections. Based on sequence analysis it was found that the set of probes for specific groups of methanogens developed by Raskin et al. would not hybridize to a potentially important group of rumen methanogen sequences identified in this study. Additional studies need to be conducted to determine the quantitative significance of the newly identified groups, as well as how the diversity of rumen methanogens varies with animal diet. Rumen samples were obtained after manual mixing of rumen contents from five rumen-fistulated mature Holstein dairy cows. The contents were squeezed through two layers of cheesecloth and then subsampled for extraction of DNA. The cattle were mid-lactation cows fed a total mixed ration consisting of 9 % hay, 26 % alfalfa haylage, 30 % corn silage, and 35 % concentrate (13 % barley, 50.8 % corn, 28.1 % roasted soybeans, plus vitamins/minerals). Samples from the cattle were obtained prior to the first morning feed. Primers specific for the 16S rDNA sequences from Archaea  were used to amplify DNA extracted from clarified rumen fluid of the cows. Rumen fluid was clarified by centrifugation for 10 min at 600 × g, 4°C, allowing us to examine free-living Archaea, avoiding symbiotic methanogens associated with protists [9,10,11]. Rumen fluid DNA extraction was carried out according to the method of Whitford et al. , except that extractions were carried out only on fresh rumen fluid and the resulting DNA was frozen at -70°C until used in the PCR reaction. The primers used were 1Af (5'-TCYGKTTGATCCYGSCRGAG-3') and 1100Ar (5'-TGGGTCTCGCTCGTTG-3'). PCR reactions were set up as described  using Taq DNA polymerase (Boehringer Mannheim Inc., Indianapolis, IN), except that 5 % (wt/vol) acetamide  was included in the reaction mixtures. A separate reaction was done for a sample from each of the five cows. Amplification was performed for 30 cycles of 95°C for 40 s, 55°C for 1 min, 72°C for 2 min, and a final extension step at 72°C for 3.5 min . The PCR reactions were pooled and the resulting 1.1 Kb PCR product was gel purified, cloned into pGEM-T (Promega Corp., Madison, WI) and transformed into electrocompetent Escherichia coli XL1-Blue MFR' cells (Stratagene, La Jolla CA). Plasmids from randomly selected transformants containing appropriately sized inserts were sequenced as described . Sequence fragments were assembled using Sequencher version 3.1 (Gene Codes Corp., Ann Arbor, MI). Sequences were compared using the Blast algorithm to sequences available in GenBank. Sequences were aligned with related sequences using the program TKDCSE . Phylogenetic analysis was performed using a neighbor-joining method with pair-wise gap removal, the Kimura-2 correction and evaluating 1000 bootstrap trees as implemented in the PHYLO_WIN package . Sequences were also compared by generating similarity matrices. Nucleotide sequences have been deposited in the GenBank database under accession numbers AF029171 - AF029211. Bacterial strains and cloned sequences are listed below with their GenBank accession numbers: Halobacterium halobium (M11583), Methanosarcina barkeri (M59144), Methanosarcina mazei (U20151), Methanococcoides burtonii (X65537), Methanolobus taylorii (U20154), Methanomicrobium mobile (M59142), Methanobacterium bryantii (M59124), Methanobrevibacter smithii (AF054208), Methanobrevibacter ruminantium ATCC 35063 (from the Ribosomal Database Project (http://cme.msu.edu/RDP)), Methanosphaera stadtmanae (M59139), MPm3 (AB026175), MIp2 (AB026169), MPm1 (AB026173), MEm2 (AB026171), MPm2 (AB026174), MEm1 (AB026170), MIp1 (AB026168), MEm3 (AB026172). This research was supported by the Dairy Farmers of Canada and Agriculture and Agri-Food Canada through the Matching Investment Initiative. Critical reading of the manuscript by Dr. Athol Klieve is gratefully acknowledged. This paper represents LRC contribution number 3870005.